In a heartening announcement, Kodak has struck a deal with the major studios to continue the production and use of 35mm film. Kino Lorber is Kickstarting a DVD Set called “Pioneers of African American Cinema"
Jillian Mayer (#PostModem, The Adventures of Christopher Bosh in the Multiverse) has a new (very) short film. Video Essayist Tony Zhou has a new short video about staging & visual geometry in Kurosawa’s The Bad Sleep Well. Jia Zhangke has made a lyrical short film for Greenpeace called “Smog Journeys” focusing on the effects of air pollution in northeast China. Here’s a quick roundup of some of my favorite links from the first couple weeks of 2015. The idea for the new year is to post things like this more regularly but with much more self selection and curation so I don't go insane trying to keep track of everything. Tired of Awards Season Bloat? Here are some alternatives. When even something like the Independent Spirit Awards seem to be colonized by movies that are not, by current standards, independent (4 of the ISA nominees for Best Picture also have an Oscar Nomination for same, and the line for eligibility is that a film have a budget under $20 million) it’s time to look elsewhere. It should go without saying that I don’t have anything against larger budgeted films, but the field of view on what’s happening in contemporary cinema shouldn’t be so narrow. Thankfully we have a few able guides. In addition to picking up the publishing pace of content here in the site, I’m also adding a new feature: an occasional round-up of articles, online videos, films, and recommendations. The content here will reflect what I’m reading/viewing/discovering each month both new and old, though it will be neither exhaustive nor too selective, as either would require too much effort. Michel Gondry has a new music video out for Metronomy’s “Love Letters”. Celia Rowlson-Hall has been making waves lately for her short films and choreography. The Audition is super short, but packs a punch. Her first feature, a silent dance film, was just successfully kickstarted and will star Amy Seimetz. There are even more shorts on her website. Another place to look for new shorts is Borscht Corp. - a collective of filmmakers based in Miami, FL. Perhaps not coincidentally, both Rowlson-Hall and Seimetz have produced shorts in collaboration with them. Check out #Postmodem from Jillian Mayer and Lucas Leyva. Anahita Ghazvinizadeh has received a number of glowing mentions at film festivals with her new short film Needle, but you can take watch her earlier short When the Kid was a Kid above. Experimental filmmaker Jodie Mack has been in a lot of festival coverage lately for her films Dusty Stacks of Mom and Let Your Light Shine. You can see a number of her earlier short films and videos over on her Vimeo Channel, though. Thanks to the AWESOME Recommended Viewing blog over at The Seventh Art (who also have TONS of interviews with directors as their main content) I was introduced to the short films of Japanese experimental filmmaker Takashi Ito, including the haunting Thunder. You can find more of his films online fairly easily. For the Venice International Film Festival’s 70th anniversary they had 70 filmmakers create short films. Above is Athina Rachel Tsangari’s “24 Frames Per Century”. Evocative of anything familiar? Check out the rest of the shorts here. Tsai Ming Liang’s new film Journey To the West is available free online for a few more days. It features the always wonderful Denis Lavant, whose past collaboration with director Jonathan Glazer for Flake chocolate bars recently made its way around the interwebs. Avant-Garde titan Michael Snow recently came to Washington, D.C. for some screenings. While you can view some of his major 16mm films on YouTube, they really should be viewed on film in a theater, and I won't directly link them here. One thing I did find, though, was one of his more recent forays into digital filmmaking, *Corpus Collosum broken up into sections here. For a wealth of Michael Snow articles, essays, and even a lengthy video lecture by the man himself, check out this post over at the indispensable cinematic resource Film Studies for Free. Another recent D.C. screening I attended was the 1946 film noir The Chase. Besides a delectably devilish supporting turn from Peter Lorre, this brutal little film offers a sly twist on your typical noir scenario by pulling the rug out from under the narrative half way through, and ultimately leaves you with a “was it real?” style quandary that would later be utilized in films like Total Recall. After watching the film be sure to read Nick Pinkerton’s sharp essay on it. Retiree terrible Steven Soderbergh is up to his now usual bag of tricks, releasing a mash up of the Alfred Hitchcock and Gus Van Sant versions of Psycho on his website. He also has been doing some writing (on Chinatown, among other things) and speaking about past filming experiences. If you’ve got an hour to spare, I’ve got an oldie-but-a-goodie for you: Thom Andersen’s must see documentary / essay film on the life and achievements of one Eadweard Muybridge (pronounced Edward My-bridge), whose work you are guaranteed to be familiar with, even if his name seems like something out of a Dr. Seuss book. Not only is it fascinating biography, it probes into the very essence of cinema. Absolutely essential, and it’s only an hour. For a recent cinema recommendation, there’s Nandan Rao’s Hawaiian Punch - newly debuting online over at NoBudge.com - Rao’s The Men of Dodge City was a favorite of mine last year. - Battles Without Honor and Humanity - Kinji Fukasaku’s (Battle Royale) opening chapter of a the epic The Yakuza Papers - bloody, brutal, stylish, and nearly impossible to follow, and yet I was enthralled the entire time. Another FSFF entry, this time a gathering together of links related to the theme of the flâneur and the cinema of Richard Linklater, as well as this video essay by Rob Stone about walking the streets of Berlin, trying to retrace the steps Jesse & Celine took in Before Sunrise. Video Essayist and all around digital chameleon Nelson Carvajal has been hard at work lately putting out a number of video essays on subject ranging from Women in the films of Martin Scorsese, the films of Darren Aronofsky, and a short documentary about the return of the micro-cinema. Below is his video essay “Mise en Scène & the Visual Themes of Wes Anderson”. Over at Fandor, Kevin B. Lee presented his annual series of videos essays arguing which films he believed should win Oscars. Below is one of the best ones. Lastly, this short video about the Criterion Collection’s restoration process should act as a delightful little dessert after all these intense narrative & essay selections. I recommend pairing it with this article from The Dissolve on the state of film preservation. The SundanceNOW blog recently (and supposedly only temporarily) closed its doors, bringing to an end two really great weekly columns: Michael Koresky’s archeological/sociological/personal reminiscence examination of cinema Here & Now & Then and Nick Pinkerton’s Bombast. Both of them use their last posts to provide indexes of their entire runs, and therefore you should beware of falling down a rabbit hole of great writing if you click either of the above links. Sounds good to me. So far he’s covered Alain Robbe-Grillet, Darkman and The Shadow, The Carey Treatment, Richard Fleischer and Barrabas, and The Bowery and Gangs of New York. At Reverse Shot, they have kicked off a new symposium examining the cross pollination between Television and Film, which shouldn’t need any more words from me to get you over there. Michael Koresky on the “Painterly” films of Vincente Minelli over at Museum of the Moving Image. Kevin B. Lee applies cinemetrics to Oscar nominated films for the New York Times. J. Hoberman on 12 Years a Slave and a recent Sci-Fi influenced art exhibit at the New Museum. Fandor has a dispatch from “Film Drunk” critics at True/False on their favorite films of the festival. We may be getting a new Star Wars related film sooner than we think, and not from somewhere expected. The short Black Angel played in front of The Empire Strikes Back in the UK and Australia and was thought lost to time until it was recently found in a Universal Studios archive. It’s been rough for cinephiles losing both Alain Resnais and Chris Marker in the span of less than two years. Here’s a look back with some footage of both of them receiving an award back in the 1950s for their collaboration Les Statues meurent aussi. In other Marker related posts, Kevin B. Lee has a short video condensing Marker’s Remembrance of Things to Come into a few short minutes, highlighting how deftly he could organize stills to create both a compelling biography as well as a sharp social critique. 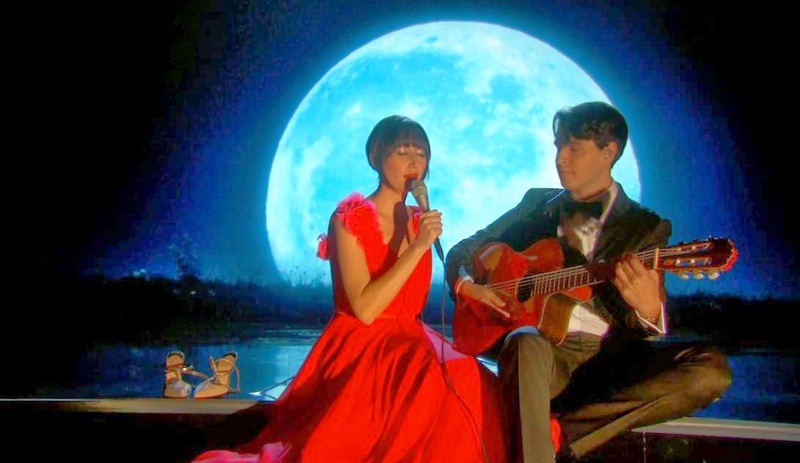 “The Moon Song” appears to be a spiritual stand-out from the other “Best Original Song” Oscar nominees: it’s a little more obscure, and it’s unpolished compared to the radio-ready sheen of the other nominees. But its lack of polish shouldn’t be mistaken for “authenticity,” at least the kind that many enthusiasts of similar, unpolished folk enjoy. Both the vocal and guitar here have a highly affected tentativeness that probably fit the director’s demands here, and the tentativeness in Karen O’s voice sacrifices a solid “hook”-esque melody for the sake of character and syncopation. “The Moon Song” might be toying directly with that issue of manufactured emotional authenticity, given that the film is addressing the boundaries of meaningful passion between a man and an operating system; in which case, the approach of this song to “be raw,” or “be real,” is well-executed, even if it is affected.1 It’s unfair to judge the merits of the song itself on the reviewer’s own ideas for its intent; these theories are unsubstantiated, projected, and, even worse, this writer hasn’t seen the film for which it was written. But let us assume that the eccentricities of the vocal performance and guitar performance are there for a reason. What do we make of the song then?